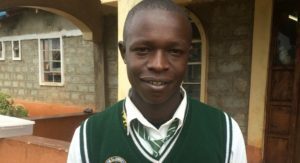 Hillary Ndori is our oldest boy, a great leader for the other children and known as a good storyteller. He earn good grades on his final examination, the K.P.C.E. through his determination and constant practice. Hillary is currently in College on his second semester studying industrial chemistry. Hillary’s favorite subject is science, and he often works math problems in his spare time in hopes of getting better at them. His favorite color is maroon, his favorite Bible verse is Romans 10:17, and he aspires to be a pilot for the military one day. He just graduated from high school and did so well. He is currently waiting to join university. We are so proud of him and we can’t wait to see where he will join college. Please pray for him. Hilary is currently in Sophomore in College. Hilary’s College fees is estimated $500-$1000 per year. Grace of God Children's Project, Inc.